Keep reading to see how I did on my April goals, and what I want to achieve in May! -Race the 5k and 10k. Yes! I really pushed myself in both of these races. I hit both of my "B" goals which I'm happy about! -Try a new workout class. Yes! I tried "Group Active" and it was a lot of fun! -Follow my training plan 100%. Yes (ish). I stuck mostly to the plan, but had to change up a few runs based on weather. 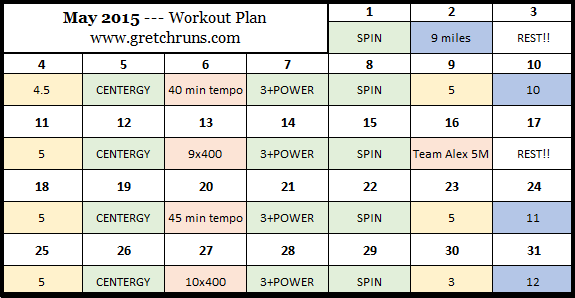 I also switched up my speed workouts, but still did one speed workout a week. I count this as a victory and will say that I achieved this goal! -Read two books. Yes! I finished Paper Towns by John Green and Runner's World Big Book of Marathon Training. Loved them both! -Cook a different cuisine. Yes! Check out my post here. -Go to church. Yes (ish). I did go on Easter, which is cheating. I'll make this my goal again in May. -Try a new workout class. This was a great goal to have last month and pushed me out of my comfort zone. I want to do it again in May! -Negative split in the Team Alex 5 miler. This is my only race in May, and I run the course all the time, so there's no reason why I shouldn't be able to negative split! -Stretch and foam roll 5x a week. Now that I'm in my final full month of training for the Biggest Loser Half, I need to focus on recovery more. Foam rolling and stretching is really important, so I'll make sure I'm getting in a good amount this month! -Go to church. Like I mentioned above, I failed on this last month. -Read 2 books. This was easy last month, so I'll be setting that goal for myself again this month! Also, I want to get a library card and visit the library. There's one right by my apartment, and it's so much cheaper to borrow books then buy them for my Kindle! -NO SHOPPING. To go along with the previous point, I need to take a month off from spending money. Between going to Europe and shopping for Europe, my bank account could use a break! - Cook Greek food. Next on my "Cook around the World" challenge is Greek. Anyone have favorite dishes I should try? How did your April goals go? I have the Runner's World big book of running ( which I haven't read all the way through yet). But I have never heard of the big book of marathon training. Perhaps I should put that on my list! It has lots of good information for new runners so it wasn't too useful in that sense for me, but i liked the stories and workout ideas as well as eating plans! Great job hitting your goals in April! Your May goals look great, only thing I would consider would be adding more rest days. 12 straight days of running/cross training leading up to a race would basically guarantee that I would not be able to race at my full potential. Oh no!! Lol I think you deserve it all for all your hard work though. But yes to a may ban. I need it. I did a new workout class last month and want to keep it up. I heard so many things about Pure Barre that I was curious. If my legs are jello and I need to hold on to the car to gas it up, I'd say the class worked. Wow that's impressive! My gym only offers once Barre class and it's in the morning during work, so hopefully they'll add more soon so I can try!! You did great this month! Proud of you lady. Keep it up, the no spending will be hard but I have faith in you! Ohh nice! Find out if your library can lend books to your kindle, that's what mine does. it makes it SO easy! i go to church every sunday and it's not cheating to go on easter :) but glad you are trying again. have a great weekend! I used to go every week until I moved! My church is further away but still not bad so I need to just do it! Good job with your April goals! :) If you're doing Greek, Greek salad is easy and one of my favorite summer foods...I just made it last night!